Food Prepared By : Mdm Layut J. 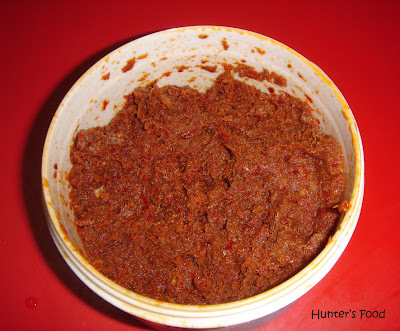 This delicious sambal paste was prepared by Babai's grandma (my future grandma-in-law :D). It was my first time trying it, and it tasted like heaven!!! I've digged the recipe from Aunty Mary (Babai's mom), and this is roughly what I could remembered..
1. Dried prawns to be soaked in warm water. 2. After rinsing, grind the dried prawns together with red chillies, onion, belachan, salt and water. 3. Heat oil in the wok and fry the mixture until fragrant and sambal drier (to personal preference). 4. Great to be eaten with white rice and accompanied by 'petai'. tak pedas sgt.. kaler jer merah. merah cili kering kot. kebetulan meja pulak merah.. lagilaa..